Be transported to a shoot in the Scottish Highlands complete with pine trees, the scent of the outdoors and dress up tweeds. 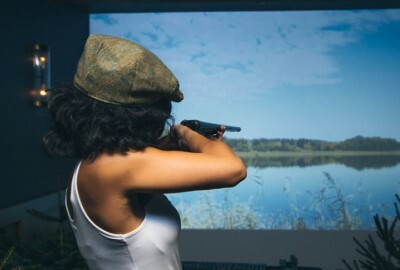 Our Virtual Shooting Range at our City Site close to Liverpool Street station opened in early 2018 and has proven hugely popular with local office parties, groups of friends and of course, keen huntsmen. The voucher gives access for up to one hour for groups of 2 - 10 people. Virtual Shooting Range is located at our Devonshire Square site in the City - 5 mins from Liverpool Street Station. Vouchers can be redeemed at any time from 3/1/19 onwards subject to availability. Slots must be booked ahead of time.